On the 9th of September last year I stood, at 10am, in a Church Hall with sweaty palms and a sick feeling in my stomach. Not because I was worried that Jesus wouldn't want me for a sunbeam, but because, with support from the fabulous Plum & Ashby, we were about to open the doors of our very first Occasional Home Store: bringing together vintage traders, designer makers and pop ups of our favourite interiors stores so that people could shop the best of contemporary and vintage homeware under one roof. 2. There were some serious shoppers waiting to get their hands on our Scandi/Vintage bargains. The rest of the day passed in somewhat of a blur with interiors fans having come from not only all over London but all over the UK to visit the Occasional Home Store. When the dust had settled and I had finally stopped regretting the fact that I chose hairstyle for the day that made me look like a cross between Mary Beard and Bob Monkhouse, we started to think about doing it all over again. It was at this point that a very serendipitous e-mail popped into our mail boxes from Jude, the events manager at the West Reservoir Centre. She had been to the Occasional Home Store and wondered if we might ever consider bringing our event to her venue. Intrigued we whizzed down the A10 (scratch that, slowly crawled down the A10) to go and take a look. It is an old 1930s water filter station (nothing floats my boat more than an industrial purification process) which looks out over a reservoir and it was love at first sight. It is hard to believe you are in Hackney when you are inside and gazing out over rippling water. It has high ceilings, bare bricks and quirky industrial features in spades and offered us the space to make our second Occasional Home Store even bigger and better than our first event. Our next step was to get in touch with Vicky and Charly, the team from Plum & Ashby who had so brilliantly supported our first event to ask them if they would like to partner with us again. Luckily they said yes without hesitation so, from that point on, it has been all systems go, contacting our stallholders from Autumn and hunting out some fabulous new additions for Spring. After months of kitchen table meetings (the equivalent of our boardroom and powered by hobnobs rather than testosterone) we are now just a month away from the Spring Occasional Home Store which will take place between 10am-4pm at the West Reservoir Centre near Stoke Newington in North London so here is a sneak preview of what we have in store for you.. 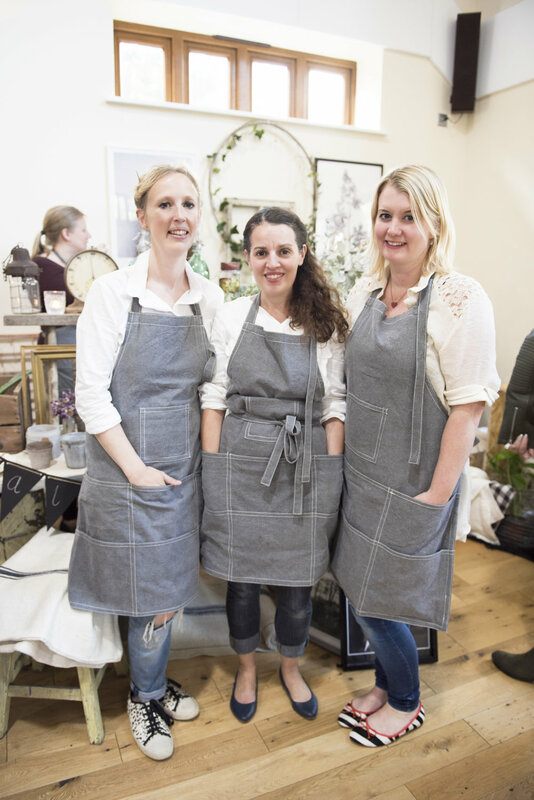 Plum & Ashby's beautiful, stylish range of products for, bath, body and home flew off their stall in September and with new products and gorgeous spring scents on offer we expect the same to happen this time round. They will be taking over our insta meet up area for some Saturday, setting our shoppers a Plum & Ashby styling challenge with the change to win some gorgeous goodies from their range. If we are really lucky Vicky's adorable dog Bertie may also come along this time. One of our favourite things about organising the Occasional Home Store has been hand picking a selection of our favourite vintage traders so that you can experience beautifully styled stalls full of unique items you won't find on the high street (unless your high street runs through the middle of a Brocante in the South of France that is). We have some of our favourites returning from last time round including beetle & WILDE, Hellish Designs (aka my mother-in-law), Dorothy Stiven, The King and I, Enamelama and one of my biggest sources of insta inspiration Kinship Creative but we also have some knockout newcomers: Vintage Curator Interiors, My Nook Shop, Fabulous Vintage Finds, Lucy Vintage Lifestyle, Grow & Gather, 12th Story, Maison Brocante, , All the Fun of the Fair , Curated Room and Early Bird Vintage. My heavy hints to Mr Malmo about needing a piece of handcrafted seaglass jewellery in my life seemed to go unnoticed at the last Occasional Home Store judging by the fact that I still don't have a piece of handcrafted seaglass jewellery in my life. So I was delighted when Fiona Petheram of Drift Jewellery, who makes each piece of her stunning jewellery collection from pieces of natural sea glass recovered from the beaches of Suffolk and beyond agreed to come back to join us again. With Mother's Day falling just one week after OHS I am sure there will be plenty of husbands, sons and daughters who will be would be making their Mother's Day by shopping from Fiona's stall (including me Mr Malmo in case you are reading this). We are also delighted to welcome the enormously talented Buddug Humphrey to our line up this time round. She is now based in Wales but lived and worked just around the corner in Hackney until recently and has a huge fanbase for her beautiful crafted jewellery which draws on enamelling techniques. I describe myself in my instagram profile as Sarah Lund meets Lovejoy. This is on account of my love of mixing vintage finds with Scandinavian inspired homeware rather than because I have a thick black mullet, penchant for icelandic knitwear and encyclopaedic knowledge of Chippendale furniture. Bringing the Lund to the table at the Spring Occasional Home Store is a stellar line up of independent stores and online businesses who offer a range of beautiful contemporary homeware including Feather & Marble, &Hobbs, Home of Boho, Lusophile, Nabo Shop, Meylor Stationery, Fellowstead, Peastyle, Lisa Valentine Home, Lived & Loved, Tinker Tailor and Ondine Ash. There is simply not space here to talk about all the amazingness that these brands are going to be bringing to the Occasional Home Store so make sure you are following @occasionalhome where we will be profiling them each individually. We are hoping some copies of Kinfolk from the shelves of Tinker Tailor's shop in Bush Hill Park will be making their way to our Spring fair. We are hoping by the 3rd of March that Spring will have sprung but even if the weather doesn't play ball, you can take home a little bit of Spring with beautiful fresh flowers from the spectacular Your London Florist. Or you could take home some seeds to grow your own peonies, roses and tulips from Grace Alexander Flowers in beautiful vintage inspired packaging. We love that Grace describes them as "tiny fragments of hope, potential and happiness waiting to happen". And if you want to keep that Spring feeling going when you get home then you don't want to miss the stunning faux floral creations of Walnut & Willow Flowers. Fashion moves in circles and it's all things hoop-like that currently have us in spin at the moment. Once confined to the Christmas season, wreaths and their deconstructed counterparts have broken out and are now embraced all year round. We used this beautiful floral hoops to decorate the venue at our Autumn Occasional Home Store venue and had so many requests to buy them that this time we decided to run a workshop showing you how to make them yourself. Join the Occasional Home Store team and learn how to make a beautiful fabric wrapped, floral spring hoop and explore creative ideas and techniques that will see you through every season. Suitable for beginners, all materials provided. Find out what all the hoopla is about for £22 excluding entry to the Occasional Home Store. Click here to book. Tips and advice for creating great visual content for your Instagram or blog with the 91 Magazine team. 91 Magazine publishes a biannual print magazine, a quarterly e-zine and a blog, all filled with beautifully curated content and photography. In this workshop, editor Caroline Rowland and 91 photographer Jemma Watts will be sharing their knowledge on how to best style, shoot, edit and curate your own images whether it’s for your Instagram feed or blog. There will also be the chance to have a go at shooting some images on the day under their supervision. Get inspired by their hashtag #seekinspirecreate and you may even see your image published on one of 91’s platforms! Click here to book a ticket for £18 (excludes entry to the Occasional Home Store). One of the biggest lessons we learnt from our first Occasional Home Store was that shopping makes people really really hungry. So hungry that Norahs Brownies and Three One Four Pie, our lovely food providers last time, completely sold out of their sweet treats. This time they will be setting their Magimixes to top speed and coming back with double quantities. We have also further bolstered our food defences with the addition of the delicious Luminary Bakery who will be bringing their baked savoury goods to feed our hungry hoards. Liquid refreshment will be taken care of by Clara's Coffee who will be serving hot drinks from their super stylish Mint Green Citroen 2CV with the Expresso Trike cycling buy to take care of all of our process needs. One of the best things about our first fair was the chance it offered to meet the people behind your favourite instagram squares in person. So when your feet are sore from shopping and you need a break from all the beautiful objects on offer it's time to head over to our Insta meet-up and hook up with your cushion crush or home styling heartthrob. We will have some fun challenges and great prizes for you win whilst you are there and it will be conveniently located right next to the Proseco bar! Our insta meet up at the last Occasional Home Store was provided by the Glam Camping CO. This time we will be indoors but will be creating an equally stylish space for instagram hook ups! There will also be the chance to fit in a quick file and polish with Minicures London joining us to provide £10 express manicures. So if all that has wet your appetite and you would like to come and join us for the Spring Occasional Home Store here is everything you need to know about visiting. Getting there: The nearest tube/rail is Manor House on the Piccadilly Line (10 mins walk away) and Finsbury Park on the Piccadilly and Victoria lines and overground (15 minutes walk or 5 minutes on the 106 bus). Bus routes stopping close by include the 341/141/106. Opening hours and tickets: Our doors will open for early bird ticket holders at 10am and to the general public at 11am. All of our early bird tickets have now sold out (eek thank you guys!). General admittance tickets from 11am are £3 and can either be purchased in advance (to save queuing click here) or at the venue on the day. Workshops: Lisa and Dee's workshop will run from 11am - 12pm, tickets are £20 and include early bird entry to the Occasional Home Store and a Norah's Brownie. Tickets to the 91 Magazine workshop which will run from 1-2pm are £18 and do not include entrance to the Occasional Home Store. Last but not least, the hoop making workshop will run from 2:30-3:30pm and tickets cost £22 which includes the costs of all materials and a hoop to take home (but not entrance to the Occasional Home Store which will need to be purchased separately). Please click here to book places on any of our workshops. Please note all tickets are non-refundable. Thanks to @tiatalula for the beautiful pictures used throughout this blog. We are thrilled Tia will be coming back to capture our Spring event.